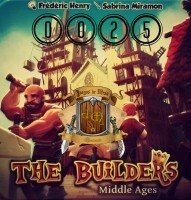 The Builders: Middle Ages requires 17 victory points to win, and buildings are worth 0-8 victory points points each. A good strategy is to build structures in the 3-4 victory point range early in the game while acquiring a balanced workforce as you go. Most mid level structures can be completed with two or three workers. And, work on two structures concurrently using one or two workers per structure per turn. Using one worker on a building costs one action per turn. A second worker requires two actions, and a third worker uses three actions. Extra actions can be purchased for 5 coins each, but multiple extra action plays gets expensive. It is often wiser to draft another worker or select a new structure to construct on your next turn(s). If you’re American and you have the spare change, substitute pennies for your silver pieces and nickles for your gold pieces. Yes, yes, yes…I know. The colors won’t match, but the conversion rate is the same. If you want your coins to feel more like coins, it adds to the gameplay.